In many cases, you will need to appear in the courtroom with your attorney at some point. Dress for success. I tell people to dress like they’re going to church or to a job interview for an office job. Defer to your attorney, but generally you do not need to go buy clothes; you just need to be clean and presentable. First impressions matter. Arrive early. Most courthouses have a security checkpoint and multiple courtrooms. Allow yourself plenty of time to navigate your way to the appropriate courtroom. The list of cases to be heard for the day is called the “docket sheet.” The docket sheet will indicate in which courtroom your case will be heard (generally by letter or number). Depending on how busy the bailiffs are at the security station, they should be able to tell you either where your case will be heard or at least where the docket sheet may be found. Be prepared. Most courthouses will not allow you to bring in a cell phone. While a few courthouses have a system that allows you to “check” your cell phone with courthouse security, you are best off leaving your phone at home or stowed safely in your car. DO NOT BRING WEAPONRY INTO THE COURTHOUSE. Virtually every courthouse will make you walk through a metal detector. Plan accordingly. Do not enter the courtroom without your attorney. Sometimes you can walk into the courtroom early, and sometimes you cannot. Rather than trying to guess, it’s better to wait for your attorney and follow their lead. Be prepared to stand, if you are able, when the judge enters the courtroom. Someone will likely announce “all rise,” but they may not give you much notice. Be patient. If multiple cases are set for the same time in the same courtroom, you will need to wait until your case is called. While you are waiting, and especially once they judge has entered the courtroom, you should sit quietly. Do not speak over the judge or any of the other attorneys or parties. You can be kicked out of the courtroom for disrupting court, and that is definitely not a good way to introduce yourself to the judge. Remain quiet. Once your case is called, you should still remain quiet. Your attorney is there to speak on your behalf. If you believe anything else needs to be said or addressed, you should write it down and put the note where your attorney can see it. Keep in mind that your attorney may have a good reason for not addressing whatever matter you put in your note. Do not let yourself become frustrated if they seem to ignore your note. Wait to discuss the matter after court. Get ready to stand again. The court will take a break, or a “recess,” during lengthy hearings and during trial. Be sure to stand, if you are able, as the judge leaves the courtroom for the break. Be careful. Be aware that most courtrooms have the capacity to record the audio of the proceedings. It is often always running. That means that whispering with your attorney in the courtroom, even if the court is in recess, may not be confidential. You may need to step into a different room for privacy if there is anything that needs to be discussed. Defer to your attorney on this. Maintain privacy. Wait until you are out of earshot of the other side before you begin asking your attorney questions about how the hearing went and/or what will happen next. Be aware that your attorney may have concerns about privacy even after you step away from the other side, so he or she may tell you that they will call you later. 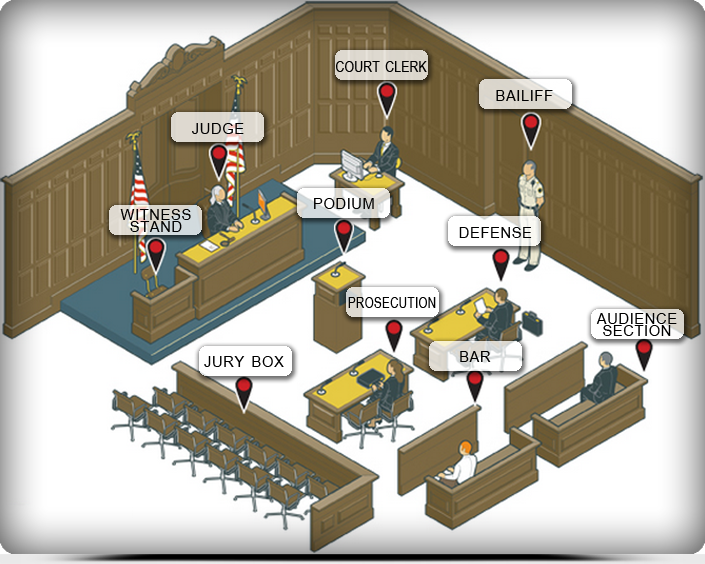 Between the judge, the courthouse, and the matter being addressed, every court appearance is slightly different. You should speak directly with your attorney to see how these tips apply to your particular case. To schedule a free consultation with one of our qualified and compassionate attorneys about your case, call 855-522-5291.